It is spring time and the sun melts the ice on the lake. Pen knows it is time to build a nest so that she can lay her eggs. The lake comes to life once the ice melts, and Cob and Pen go searching for water plants to build their home. Pen sees a pile of wood and thinks it is perfect for their home. The logs are already stacked, and Pen wiggles, squirms, twists, and jiggles on it. They cannot build their home there as it belongs to Mr. Beaver. They go in search of another place and they see a mud pile. Pen thinks it is a perfect place and steps on the clump to make sure it is strong enough to hold the eggs. The mud pile also is someone else's home. Will Pen and Cob be able to find a place that they can call home? Spring! 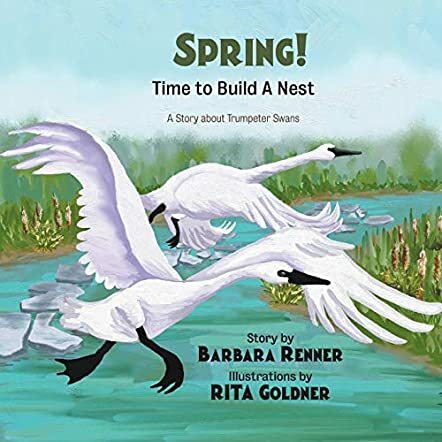 Time To Build A Nest: A Story About Trumpeter Swans by Barbara Renner is an informative and educational book that throws light on trumpeter swans. The journey of Pen and Cob is wonderful, and the illustrations by Rita Goldner make it palpable to young readers. The illustrations are adorable and they make the concept appealing and captivating. It is a good storybook to make children aware of trumpeter swans which were almost extinct in the early part of the 20th century. Their numbers have risen and there are over 34,000 of them now. Books like this with a story and information are good for children, and can be used in classrooms and at home to make learning fun, easy, and interesting. The glossary at the beginning of the book makes it easy for young readers to understand the new words in the book and thereby helps them enhance their vocabulary.